Back in the day, when it came to finding the best power amplifier, there weren’t too many choices. You had either stereo or mono amplifiers, and these came in solid state or tube state. For tube amplifiers, you could choose between push-pull or single-ended. For solid state, your choice is limited to Class A or Class A/B only. Thankfully, nowadays, there are newer options already out on the market. In fact, solid-state amplifiers are now available up to Class D, G, and H. What’s more, you can even find amplifiers that have channels ranging from one to seven or more. If you are on the market for some high-quality and powerful amps, then you’ve come to the right place. Here, we will be reviewing three fantastic power amplifiers. Let’s dive right in! To help you with your search, we did our own benchmark tests to understand an amplifier’s performance. We tested several models on the market and have managed to narrow it down to three, which we will review below. Crown is a part of the HARMAN International Industries, and their company is headquartered in Northridge, California. HARMAN is the world’s largest professional audio company. They own massive brands such as Lexicon, Soundcraft, BSS Audio, JBL, and several more. Crown designs, builds, and services for each product. This approach ensures that they drive the product to excellence. The Crown XLS1502 Two-Channel Power Amplifier is a Class D amplifier, and it features an upgraded look that comes with a larger display. Just like its predecessors, this amplifier comes equipped with the company’s well-known and patented DriveCore technology, which weighs no more than 11 pounds. The DriveCore technology can integrate the amplifier’s drive stage into the power output stage seamlessly, fusing all of it into just a chip that is exactly the size of a dime. The circuitry also does a great job at maintaining the Class D high efficiency with the lowest possible noise. What this results in is a highly efficient audio amplifier, which exhibits the phenomenal audio quality of the much more evolved Class AB design. You can choose this power amplifier in four different watt power. There is a 350-, 525-, 650-, and 775-watt power option. We tried out the 525-watt power amplifier, which comes with an AC input voltage of 100 to 200V. The amplifier comes with higher DSP capabilities. It offers more control and has a bandpass filter per channel. There is also an increased lighting functionality, and you can switch off all of the LED indicators on it, except the thermal and clip, in order to reduce the distractor at dimly lit venues. The amplifier does come with selectable input sensitivity too. You can choose between 1.4vrms and 0.775vrms so that you can drive the amplifier at the fullest power. Lastly, there is also a sleep mode to put the amplifier to sleep when you aren't using it. Behringer is an audio equipment company founded in 1989 by a Swiss engineer named Uli Behringer in Willich, Germany. In 2007, the company was listed in the top 20 manufacturers of music products. This company has a market presence in over 10 countries and has a sales network in over 130 countries all over the world. At present, the company manufactures its products in China. 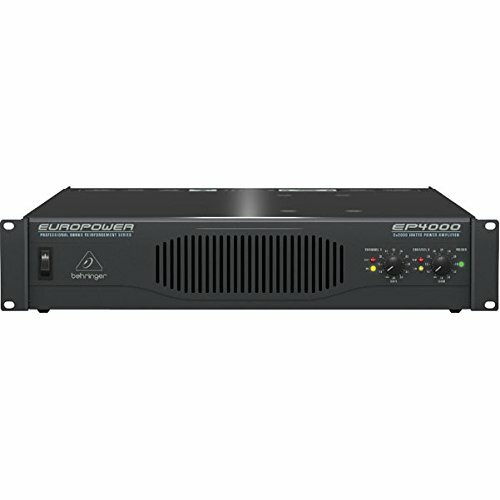 The Behringer Europower EP4000 Stereo Power Amplifier delivers stunning power at a reasonable price. You will get great reliability and sound quality with this amplifier. It is ideal for folks who want one in a medium-sized club, churches, mobile PA system, and so on. The amplifier’s straightforward rear and front panel layouts make setting it up and tearing it down a piece of cake. Even the operation could not be any simpler. This amplifier comes packed with Fairchild/Toshiba power transistors along with a high current toroidal transformer, which will give you a really high transient response and reliability. The independent thermal and DC overload protection circuitry on each of the channel does a great job at protecting the amplifier as well as the speaker from suddenly stopping. What we also liked is that there aren’t any fuses you have to deal with it. The amplifier comes with a clip limiter, which means even if you end up using it at max power, it will do so without overdriving itself and the speakers. This is all thanks to the amplifiers in-built circuitry, which automatically senses when the amplifier is about to clip. Rockville is a company that aims to provide you with products that has the best value. They have years of experience, and their products are proudly developed in the United States. The company is well known to manufacture high-end gear for car stereo, marine audio, professional audio, and more. 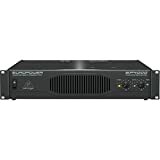 The Rockville RPA9 is a two-channel professional power amplifier. This heavy-duty device can combine great sound along with efficiency in order to deliver this equipment, which packs a lot of punch. 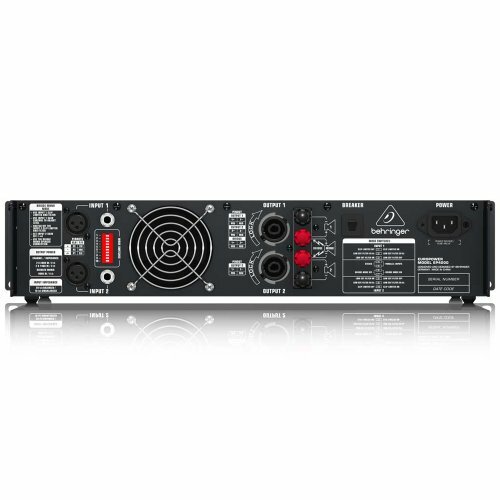 With its compact size, this power amp can easily fit into any standard 19-inch rack, and because it weighs barely 30 pounds, it makes it easy to travel around with too. The amplifier has been engineered by using advanced components and design, which creates this product that is lightweight yet so durable. It can be used daily for several years, and it will still work completely fine. The amplifier comes with computerized IC-controlled protection circuitry. This will allow delivery of peak power and at the same time do a great job at preventing any overloads. The amplifier is also optimized for four- and eight-ohm speakers and comes equipped with mono/stereo speaker output, which allows for a quick system impendence optimization. Looking at their features, pros, and even their cons, it is clear to see why these three are among the best power amplifiers on the market right now. Then again, between them, there is one we really liked, and that’s the Behringer Europower EP4000 Stereo Power Amplifier. For starters, this amplifier comes from a well-known brand. It is built well and is highly durable. While being reasonably priced, the amplifier can provide you with loud sound with brilliant quality. This is the kind of amplifier that will easily last for years, and we believe you should try this one out.